As a Singaporean, I am proud to say that Singapore is home to the best airport in the world. If you think that the same pride extends to our public transport system, you are not wrong. Despite recent performance issues, our public transport system is actually quite convenient and reliable. Places that aren’t accessible by MRT (Mass Rapid Transit), are covered by bus services that visit even the quietest neighbourhoods. 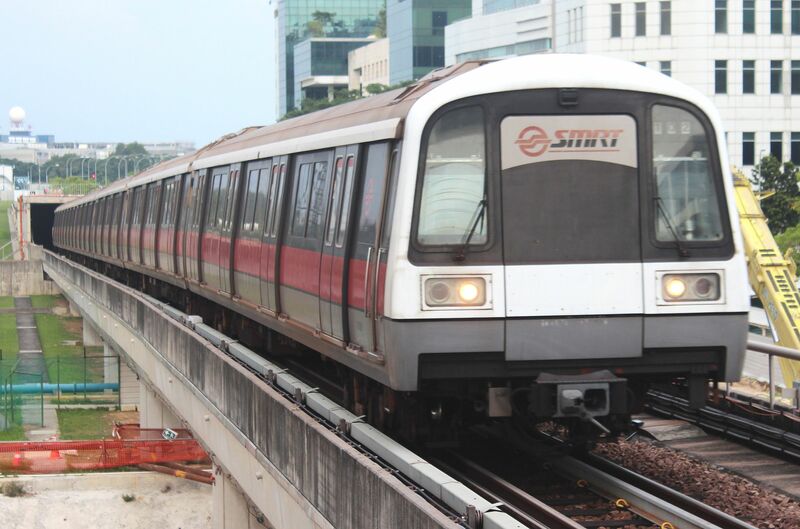 If you’re coming to Singapore for the first time, there’s an MRT station connected to the airport terminals to take you to the city centre, or anywhere else in Singapore for that matter. 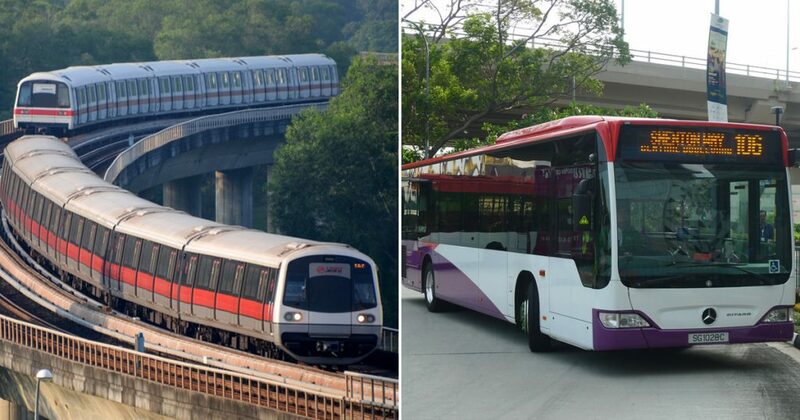 But before you take the MRT or bus, you need a ticket or an EZ-Link card. Now you can choose to purchase a single trip ticket from the ticketing machine at the station but that’ll just be a waste of time if you intend to take public transport frequently during your time here. Get yourself an EZ-Link card from the TransitLink Ticket Office. If you’re flying into Singapore, the nearest ticket office can be found at Changi Airport MRT station. Other ticket offices can be found at these MRT stations – Ang Mo Kio, Bayfront, Bugis, Chinatown, City Hall, Farrer Park, Harbourfront, Jurong East, Kranji, Lavender, Orchard, Raffles Place, Tanjong Pagar and Woodlands. 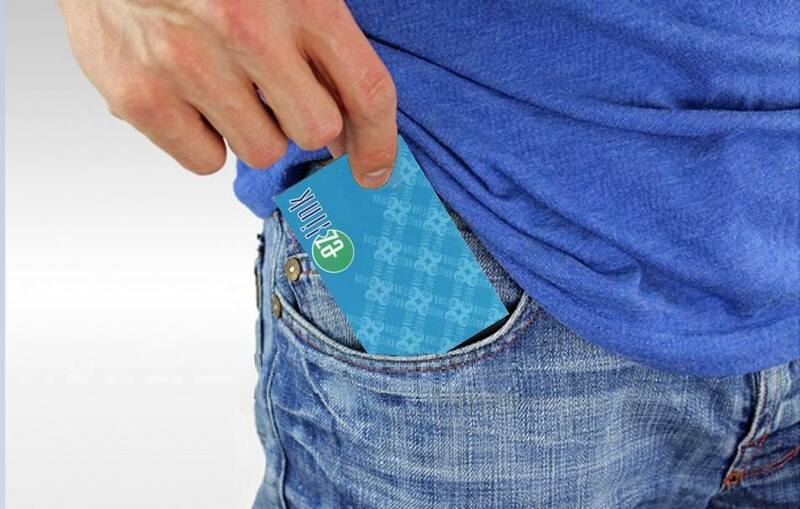 For SGD$12, the card comes with stored value which allows you to use it immediately. The EZ-Link card is valid for 3 years so if you’re making numerous visits to Singapore, you can continue using it. That’s not all, certain places even accept payment via EZ-Link so it’s not just limited to public transportation fares. Recently there’s been a trend of people using EZ Charms instead. They have the same function as an EZ-Link card, just that they’re much cuter. 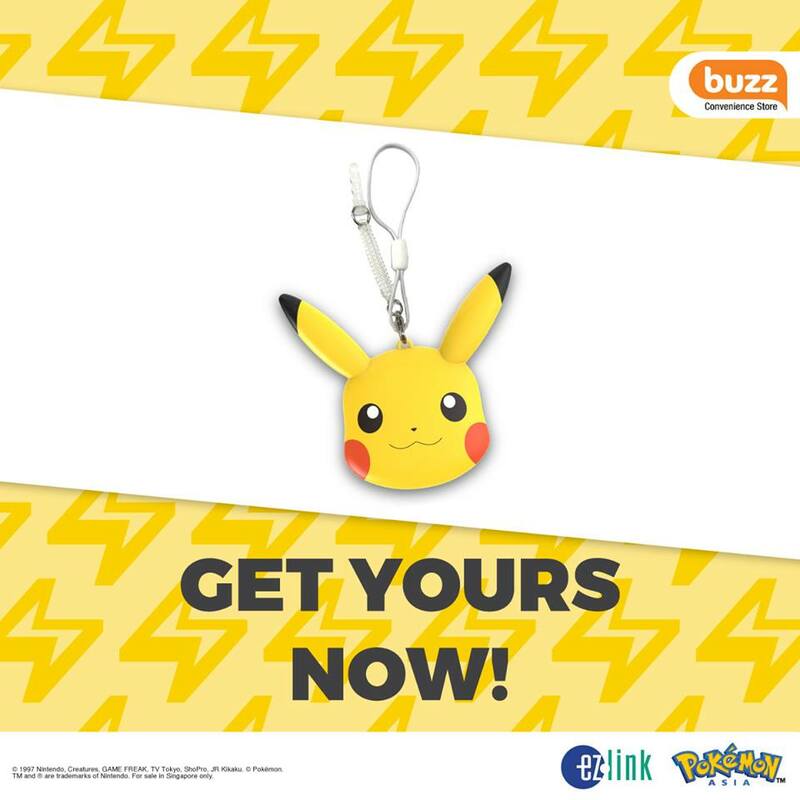 And they’re charms, like this cute Pikachu one that’s currently available at all Buzz outlets islandwide. But if you’re only in Singapore for a few days, you can consider getting the Singapore Tourist Pass which grants you unlimited rides on Singapore’s public transportation for the valid duration of the pass (maximum of 3 days). Singapore Tourist Passes can be purchased at the locations listed here. So, now you have your very own EZ-Link card and a destination in mind. But the question is, which line to take? 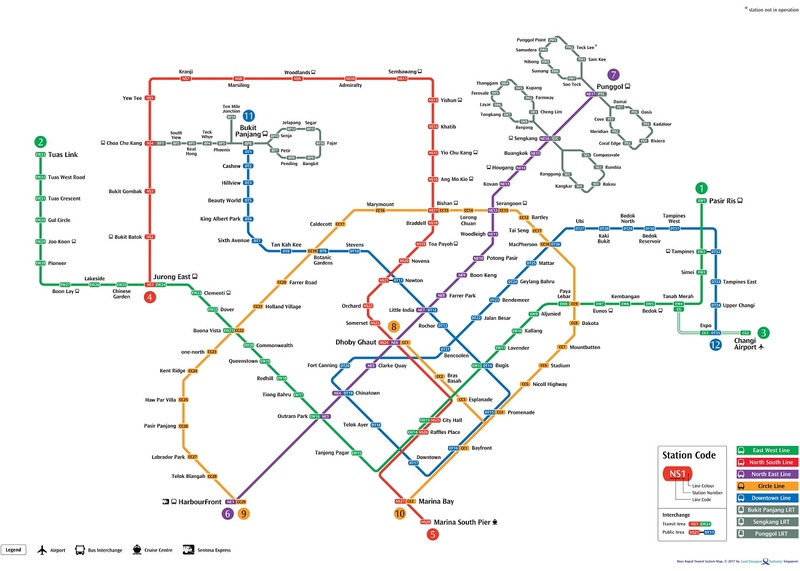 There’re so many options – East-West (Green), North-South (Red), North-East (Purple), Circle (Yellow) and Downtown line (Blue). All the lines are pretty straightforward. The signs in the station will indicate the final stop of the direction that they’re headed. For example, if you’re going to City Hall station from Tanah Merah on the East-West line, then you should be taking the train headed towards Tuas Link (the last station on the West-bound East-West line train). Most attractions in Singapore are within walking distance from an MRT station so you don’t have to worry so much about getting lost. Bus services here are extensive and they’re an economical mode of transport around Singapore. You can get yourself a brochure that lists all the stops for a particular public bus service, at the interchange. If you’re planning to visit the tourist attractions, there are also “hop on hop off” bus services, although they’re pricier. You can find different “hop on hop off” bus tour packages here. Cabbing is definitely the most efficient and fastest way to travel around Singapore. 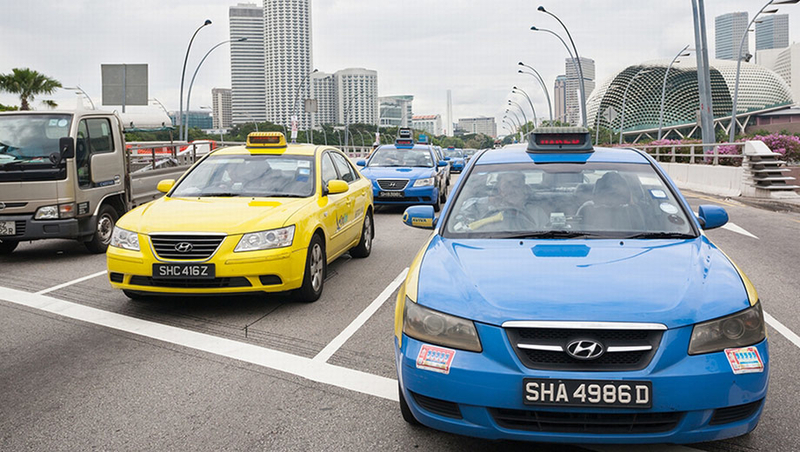 Cabs in Singapore go by the meter, and there might be additional surcharges depending on the time and location that the cabs are hailed. You can hail a cab almost anywhere. The best spot would be by the main road, although we suggest you do so at a convenient location so that traffic is not affected. Alternatively, you can book a cab by calling the common taxi hotline at 6342-5222 or if you have any ride-hailing apps, those work here too! 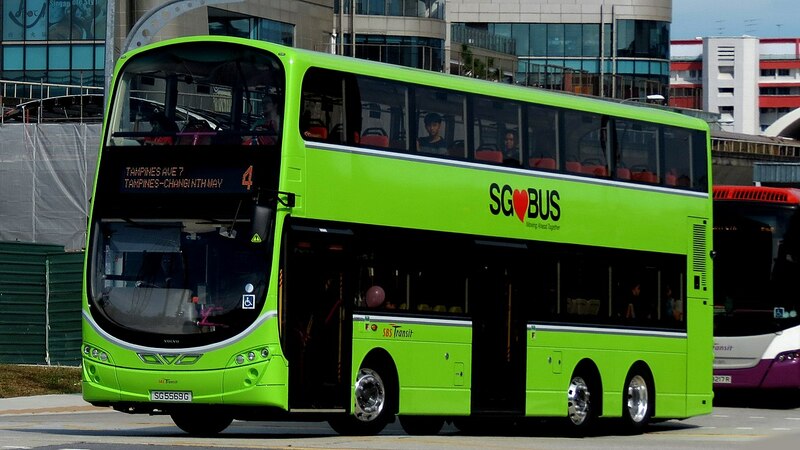 Now that you’re ready and equipped for the public transport system in Singapore, it’s time to get exploring. If you’re not sure where to go, check out our list of must-visit places in Singapore!